Graphs offer a natural way of representing chemical structures. In this case the atoms are the nodes of the graph and the bonds are the edges. We can then “color” the nodes with atom types and “weigh” the edges with bond types. 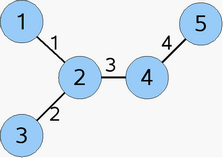 This graph, which contains nodes and edges with different properties, is the molecular graph. Connection table, ctab: the i-th row defines the indices of the atoms connected to the i-th atom. Please note that instead of getting the full bond table we are planning to introduce a new method that gives back the bond index between atoms i and j. Connections between the atoms specify the topology, but the relative spatial arrangement of atoms – the configuration – also needs to be defined, as molecules with same connectivity but different spatial arrangement – stereoisomers (see stereochemistry for details) – should be expressed. Spatial dimension of the building atoms defines the dimension of the molecule. 0D – all atoms are in [0, 0, 0]. 2D – z coordinate is 0, [x, y, 0]. The dimensionality can be retrieved by the getDim() method of MoleculeGraph class. It can be set by the setDim(int d) method, but setDim(int d) does not generate coordinates for the molecule. To generate coordinates, which is obviously needed (bear in mind that it can be a slow process), the clean(MoleculeGraph mg, int dim, java.lang.String opts) method of chemaxon.calculation.clean.Cleaner class can be used. Once the molecule is built the atom and bond indexes are fixed, they don't change with property changes (like changes in atom or bond type), but if the structure is modified with removal/addition of atoms or bonds, the indexes are changed. Please note, that atoms and bonds are indexed from 0, but MarvinView and MarvinSketch show the indexes starting from 1.